Born in California, Jean grew up in American Samoa and Juneau, Alaska, where she developed a passion for wildlife and the beauty of nature. "I was so fortunate to enjoy a childhood in such wonderfully exotic and inspiring places." And the long-lasting influences of these far-away lands are at the heart of her artistic spirit. Invaluable study with Luke Frazier, Matt Smith and Scott Christensen provided the fundamentals in painting and inspiration that laid the groundwork for her impressions of nature and the wild landscape. "I owe so much to these gifted artists who have a generous teaching ethic to pass along their knowledge and inspiration." Awards and honors followed, from the Scottsdale Artists' School, plein air festivals and regional and national juried shows. After nomination into membership at the Salmagundi Club, Jean enjoyed exhibiting in New York City. Her work, created with painterly realism, is a reflection of her interpretation of the subject, and she now specializes in equine paintings. Selection of Jean's painting "Lush Life", in the Top 100, Arts for the Parks, 2004, was another milestone, the continued search for excellence and meaning. Jean's paintings have been juried into the Western Spirit Show at the Old West Museum in Cheyenne, Wyoming, the Grand National Rodeo Celebration of Western Art at the Cow Palace, San Francisco, the American Academy of Equine Art Annual Show at the Kentucky Horse Park, Lexington, Kentucky, and the Cattlemen's Western Art Show and Greeley Stampede of Western Art. Jean was elected into membership in the American Academy of Equine Art, and in February, 2017, she was admitted into the High Desert Art League. 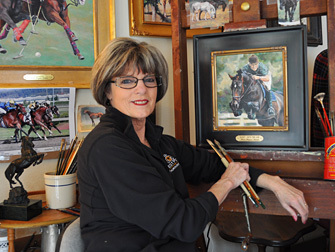 Specializing in equine portrait commissions, Jean's studio and home are in Bend, Oregon, where she lives with her husband, Harve, and she is represented by Judith Hale Gallery in Santa Barbara County.